As promised, the press conference at JR Motorsports' Mooresville, North Carolina race shop delivered itself as an early Christmas present to fans of NASCAR. With many of JR Motorsports key people at the conference Dale Earnhardt Jr, Kelly Earnhardt, Danica Patrick, and the team's full-time Nationwide Kelly Bires were the key soundbites through the event. Patrick's debut at the Auto Club Speedway has been dealt as somewhat of a curve ball considering the fact her planned stock car entrance will occur in the Daytona ARCA race. Indicating the reason for not running the NASCAR Nationwide Series 300 mile race at Daytona, Patrick responded "The race is basically a Cup race, some 30 odd drivers in Cup run in it. So, is that the right time for me to start or not? You only get one grand opening, so I've heard. We want it to be the right opportunity". It's still a odd decision to take Danica Patrick out of the heat of NASCAR Nationwide's most competitive race. It's conceivable this move might have been more to the pleasure of her sponsorship than her competitive initiation to NASCAR. The Daytona Nationwide Series race, a precursor to the Daytona 500, is also noted for its bulky qualifying lineup which can be pushed up to 50 cars for 43 spots. The Auto Club Speedway race usually features a more streamlined car count. Point being that her chances of running the actual would not be as hindered due to qualifying mishaps or weather which better serves her as well as godaddy.com brass who has brokered a lot on the most popular female racer. Another distant possibly might circle on Danica Patrick's experience in a stock car. While the ARCA series may welcome her based on 5 years of open-wheel experience, NASCAR may not be completely comfortable putting Patrick into aggressive bump drafting with only one stock car race. However, Jacques Villeneuve and Juan Montoya possessed the same limited experience finding restrictor plate racing quickly with little incident. Team founder Dale Earnhardt Jr was highly visible at the press event. Planning to drive the #5 JR Motorsports in some Nationwide Series races for 2010, Earnhardt Jr's ownership part in the team, while still valued, involves many of his family enjoying a voice on the operations of the race team. Whether putting JR Motorsports in the hands of his trusted family will improve his performance in the #88 Hendrick Motorsports Chevrolet remains to be seen. 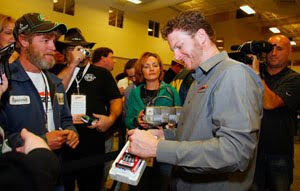 However, Earnhardt Jr's presence regularly brings out a loyal and devoted following of JR Nation; a group guaranteed to be back for the entire 2010 season. Lost behind the fanfare of Danica Patrick is the JR Motorsports technical #1 driver Kelly Bires. 25 years old, Bires takes over full season campaign inside the #88 Chevrolet. Succeeding Brad Keselowski, Kelly Bires performance is, in reality, more critical than Danica Patrick's. Much like the driver that preceded him, Bires has considerable stock car racing experience but his yet to taste splendors of victory in a major NASCAR touring series.